Rob Gray, the Building Manager for the River Centre on the Environment Trust's project team, has replied to the SOR's questions about the River Centre Business Plan. Rob is an experienced project manager who has in the past worked on multi-million pound plans for WS Atkins. The response to the SOR group is here. The Press Release, announcing the new agreement between the Environment Trust for Richmond upon Thames and the Richmond Adult Community College to provide provide environmental education and vocational courses for all ages based at the River Centre, is here (.pdf, 3 pages, 57KB). The Summary Business Plan for the River Centre, detailing sources of revenue and outgoings, is here (.pdf, 31 pages, 335KB). This was discussed at the Council's Co-ordination, Finance and Performance Commission on Tuesday, 4 November at York House. The Council is holding a consultation on the upgrade and improvement of the riverside embankment from Water Lane to Church Lane (NOT including the section in front of the poolsite). Funds for this work have already been allocated, from the Council and London's Arcadia. Plans are on view at the Civic Centre, 44 York Street, Twickenham. ind the River Centre, who are already active in the community. The Trust's AGM was held at the Orangery at Ham House on 19 June. 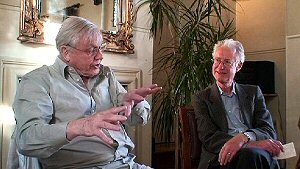 The highlight of the evening was the discussion between River Centre Patron Sir David Attenborough and Bamber Gascoigne about the Thames, living in Richmond, and the proposed Twickenham River Centre. Duration: 6 minutes, 30 seconds. A broadband internet connection is essential to view this. Technical facilities and editing kindly donated by Linkvision and Graham Skelton. Click here for a brief report on the meeting. Click here for the latest River Centre brochure, with news and the results of our survey at the public consultation in February (.pdf, 1 page, 111KB). On 14 April, the Cabinet voted unanimously to go ahead with the development brief process for the poolsite. The draft development brief provides the River Centre, the play area, public open space and enabling housing development, with the majority of the parking moved from the Embankment to the service road behind the site. Some work remains to be done on the brief, and members of the public and some councillors expressed concern at the massing and amount of the proposed housing: the enabling development has to be kept to a minimum. Nine members of the public spoke at the meeting, four from the River Centre project team, four local residents who are generally in favour of the development (subject to massing worries being addressed), and one opposing. Three councillors also spoke, about the site in general, the need to revive the town centre and fill not only the empty shops but also the empty office space, and the educational benefits of the River Centre for the whole community. The Council Officer's report to the meeting is here (.pdf, 18 pages, 173KB) with appendices showing a projected layout (.pdf, 2 pages, 159KB) and a summary of the consultations (.pdf, 14 pages, 3.7MB, slow download). Development Brief, May 2008 (.pdf, 74 pages, 3.39MB, slow download). Click here for a complete list of the sponsors for the River Centre, including the groups and individuals who are contributing their support and are actively involved in making the Centre happen. The Council, supported by the Environment Trust, held a 5-day consultation at York House on the proposed development brief for the poolsite, followed by a public meeting held by the Twickenham Society, the York House Society, the River Thames Society and other amenity groups to discuss the proposals in St Mary's Church on 18 Feb. More information on the proposals is here on the Council's website. The exhibition included displays on the River Centre (for details, see below), and a questionnaire - if you haven't completed one, please download it here (.pdf, 2 pages, 92Kb), and give us your feedback on what you'd like to see in the Centre. What is the River Centre? What will it offer? A centre for education about the river and broader environment, climate change and sustainability for people of all ages and abilities, provided by Richmond Environment Network, Thames Explorer Trust, River Thames Boat Project, Richmond's Biodiversity Action Plan, Thames Landscape Strategy, and other organisations. A 'one-stop shop' offering practical information and news about the River Thames, sustainability and climate change, along with exhibits by the Thames Landscape Strategy and organisations with responsibility for the Thames, and displays giving information on local water-based activities and clubs. A hub for environmental volunteering, a home for the Environment Trust, BTCV Richmond and Richmond Environment Network, a base for other environmental voluntary organisations, giving them access to mentoring, advice and equipment, and a centre for volunteer training. A home for HANDS (Help a Neighbour in Distress), a charity providing the elderly and housebound with support and opportunities for social interaction, and Richmond Volunteer Centre, matching individuals willing to give their time with organisations looking for support. Multipurpose spaces for the activities of all of the above and for many other local organisations, such as Twickenham Rowing Club, and events, such as the Twickenham Festival, as well as a children's playground, public toilets and a café open to everybody. 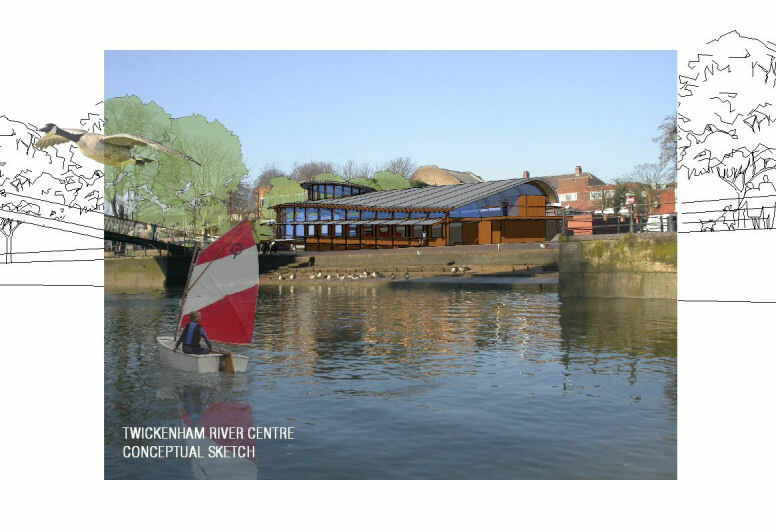 Permanent displays about Twickenham's river heritage, linking it to river-based sites in the upper Thames, such as the Henley River & Rowing Museum, and the lower Thames, such as the Docklands Museum. A boathouse, providing public boat hire, maintenance and repair, practical boatbuilding courses, water safety training, rowing for the young and those with disabilities, work experience for young people, and small boat storage, with a waterfront pontoon to improve access to Twickenham from the river, encourage river use and enable a ferry service linking with Richmond and Teddington. All in a flagship sustainable building, showcasing 'green' construction methods and wider sustainability. Below: indicative drawing of what the River Centre could look like. The above diagrams by architect Clive Chapman's practice show how the Centre could work, using the way the lower levels of the poolsite flood at high tides, and the 3 metre slope on the site from the Service Road to the Embankment. Entrance from the Embankment at the lower level gives access to the boat building area, and the storage for the shallop Jubilant, plus the kiosk for boat rental on the river, and public toilets and changing areas for river activities. This leads into the café and restaurant area, overlooking the playground - moved into place from the far end of the site on one side. On the other side is the education area, two flexibly built classrooms for accommodating school parties and teaching groups. Above this, accessible by stairs or the lift, is the lookout space, with views up and down the river. At the top of the building, at the back of the site, are offices for environmentally-related volunteering groups. A summary from Angela Kidner of the Trust's work on developing the River Centre in the last year, including the activities and facilities it will provide. Read it here (2 pages, 88KB).